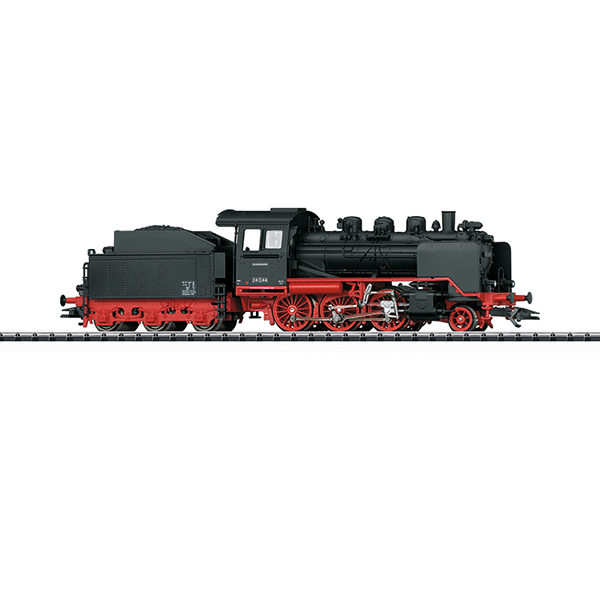 Prototype: German Federal Railroad (DB) class 24 steam passenger locomotive with a tender. Standard design locomotive with Wagner smoke deflectors. Locomotive road number 24 044. The locomotive looks as it did around 1957. Model: The locomotive has an mfx digital decoder and extensive sound functions. It also has a special motor in the boiler. 3 axles powered. Traction tires. The boiler is constructed of metal. The locomotive has a factory-installed 72270 smoke unit. The triple headlights change over with the direction of travel. They and the built-in smoke unit will work in conventional operation and can be controlled digitally. Maintenance-free, warm white LEDs are used for the lighting. There is a close coupling with a guide mechanism between the locomotive and the tender. There is a close coupler with an NEM pocket and a guide mechanism on the rear of the tender. There is a close coupler in an NEM pocket on the front of the locomotive. Length over the buffers 19.4 cm / 7-5/8".